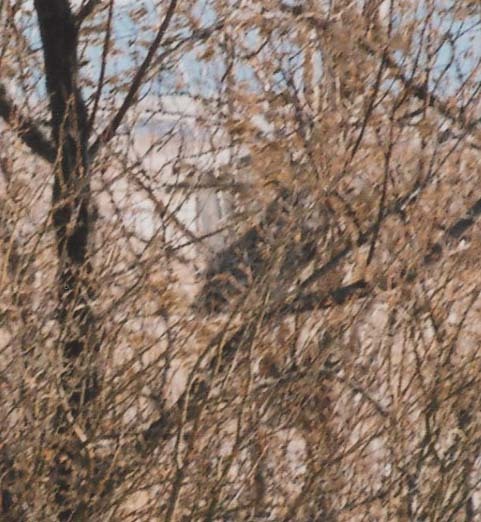 There's also a photo of an eagle flying along the road to my house. The eagles are out feeding on road kill. There are a large number of rabbits that have been hit, as well as two antelope in one day. The one antelope was a fawn from last spring. Five or six eagles picked the carcass nearly clean in three hours. The carcass was "fresh" when I went to town and nearly eaten when I returned. Eagles feed heavily now because they have offspring this time of the year. 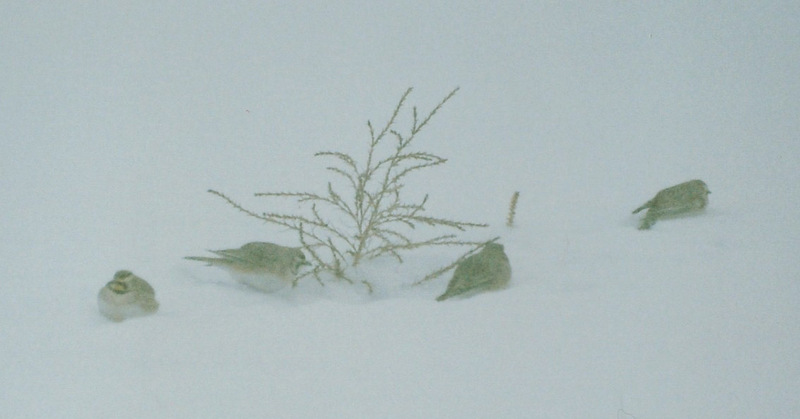 Lastly, these are horned larks feeding on seeds after a snowstorm. Usually, around a dozen birds rummage around the weeds in the snow looking for food. I don't mow my yard after August so these birds and others will have plenty of winter fair. I am starting garden plants now in my indoor greenhouse. I have found that 6 to 8 weeks may not be enough lead time for indoor starting, especially if the weather turns "dreary" as some are predicting. So I'm starting earlier. Also, I threw fertilizer on the garden to get a head start there, also. This was the weather on March 4th. Today, its warm (41 degrees, and again, no wind). The snow melts very quickly and leaves us with mud. This morning there was dense fog. That is not common for our area. Wind usually dries out the area and the humidity is too low for fog. Icicles on the well cover! All the icicles were very short in this storm. Hard to believe it's 2010 already. Weather here has been remarkably quiet. I really was hoping for the six feet of snow that Pennsylvania got, along with numerous other states. Wyoming just came out of a drought. If the snow doesn't pick up here, it's likely we will go back into the drought. March and April tend to be our heavy snow months so there is still time to get the needed snow. Mid-February tends to be a cold time. The temperature drops below zero at night, but only on a once or twice a week basis. It was below zero right before Valentine's day. It's not uncommon to have power outages during this time. February did get a normal amount of snowfall, just in small doses. Not all of it has melted at this point, though the weather is in the 40's. It still gets cold at night. The most disconcerting thing is the lack of wind. 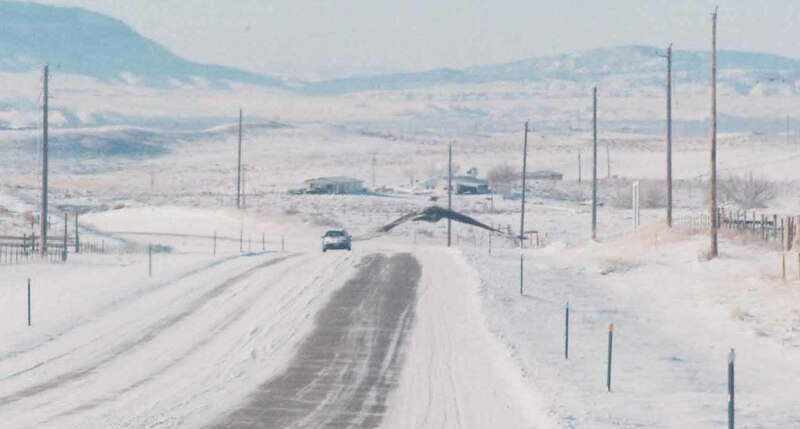 Normally, winter means 25 mph winds for weeks on end. This year, the wind has been quite absent. Today there is almost no wind. I actually have several windows open and a fan running. It gets up to 76 degrees in my house when the sun is out and the wind is calm. It's great for the propane bill--no heat needed during the daytime! I actually enjoy the fresh air, too. I'm putting in pictures of some wildlife in the area. The deer have not been around as often as in the past, possibly due to the milder winter and possibly because there are more places for them to forage, haystacks mostly. There are three large bucks that hide in the sagebrush every so often. The owl has been around also. I can see him from my bedroom window. It may be that he's looking for the numerous skunks in the area. I saw on a nature program that great horned owls eat skunks. We have had two skunks get in our trap this spring and many nights there has been the unmistakable odor of skunk. This is the time of the year they seem to start getting active. If they would stay out from under the house and away from the garden, they would be okay. We have no food around the house or garden for them, except maybe the compost pile, but it's fenced. I keep filling in holes around the skirting to keep them out, but skunks are persistent diggers. I also took a picture of antelope running in snow around the end of December. I have not often seen antelope running in deep snow, at least not recently. 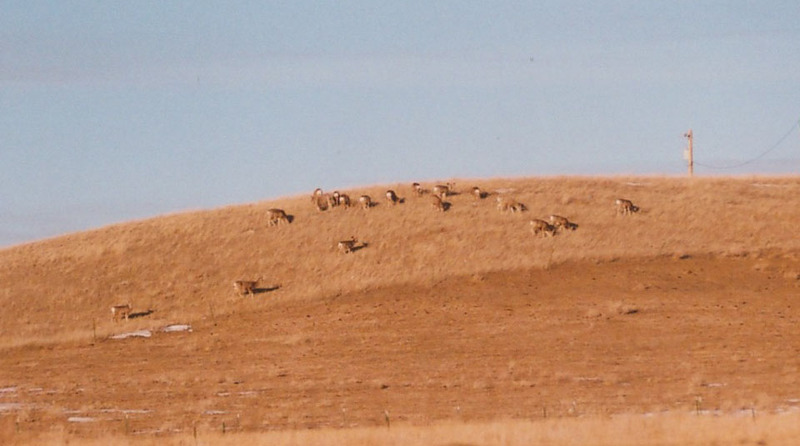 The pronghorns tend to not run in snow if they can avoid it because it takes too much energy. 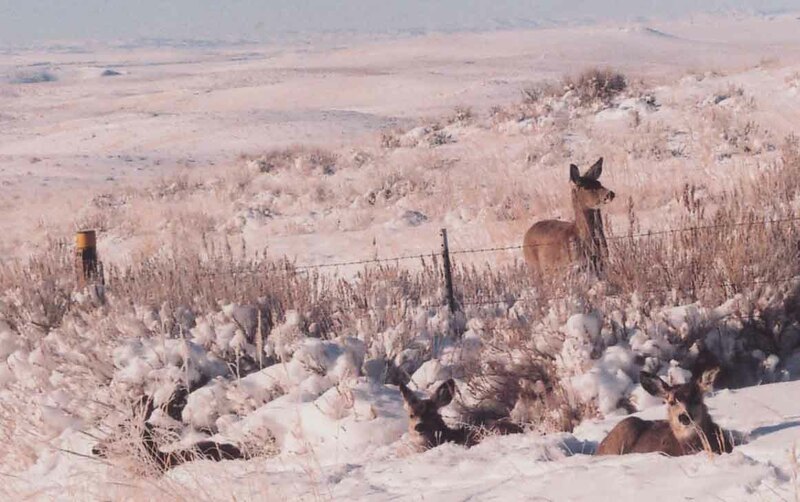 In years with deep snow, food is hard to find and the death rate for pronghorns goes way up. 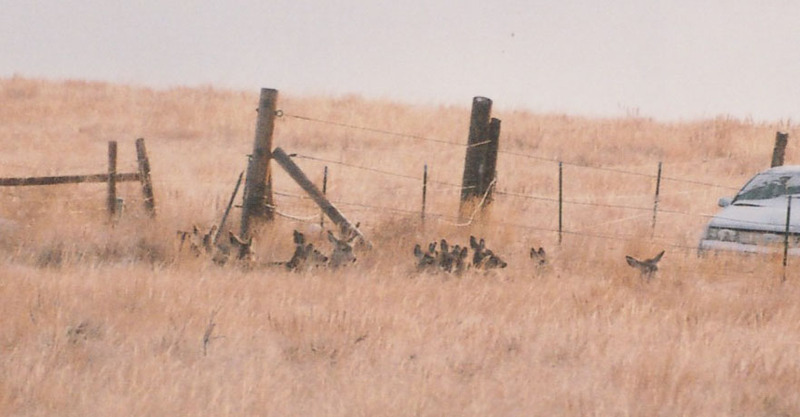 Plus, pronghorns don't jump fences as well as deer do, so they often die along fence lines. This year the snow has been spotty, so there is plenty of forage. Most deaths appear to be due to road kill.